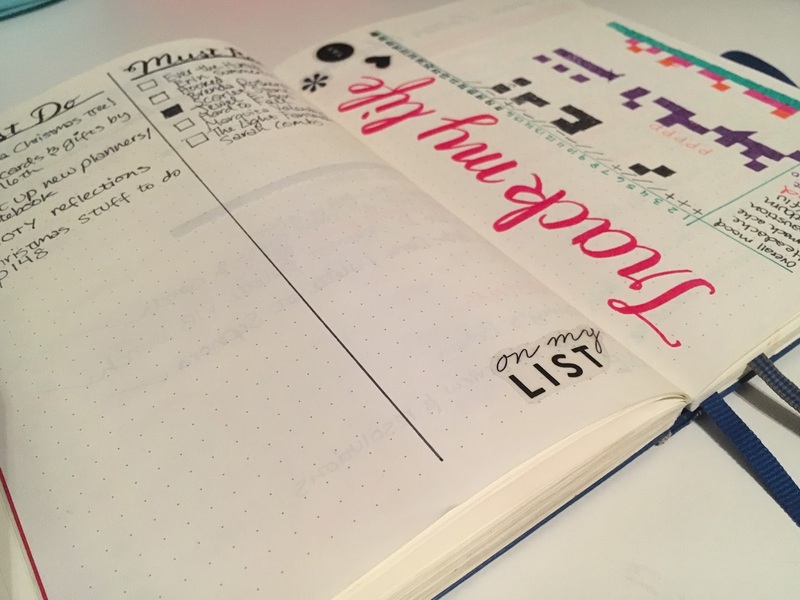 And then this summer I discovered bullet journalling, and that was another game changer. I discovered an artistic side of myself that I didn't think existed, as I learned brush lettering and got more into doodling. 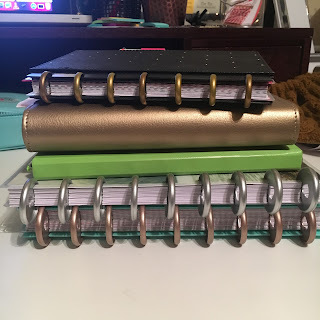 I also got back into journalling longhand - I've tried on and off throughout my adult years to keep a journal, but it never stuck. 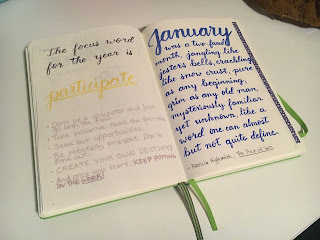 I think maybe I always felt like I didn't have anything important to write in a journal. 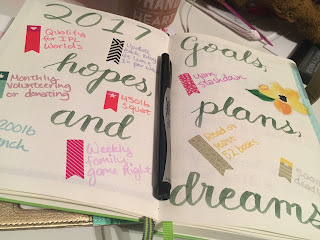 I know, I know - this obviously hasn't stopped me from blogging, but it's very easy (and cheap) to post throwaway musings on the internet, whereas taking the time to put pen to paper (especially in an expensive notebook like a Moleskine or a Leuchtturm) feels a lot more significant somehow. BUT... bullet journalling, in which I filled my notebook equally with deeply personal thoughts and daily "To Do" lists, with beautiful lettering as well as messy scribbles, taught me that no details are too small, because it's my life, and the day-to-day minutiae is what forms a person's life, just as much as the big events. 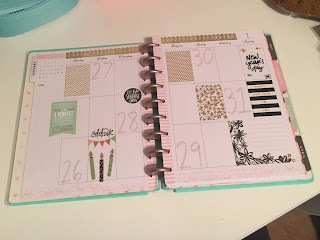 First up, I am planning to continue bullet journalling, but I am splitting the work between a Mini Happy Planner and a Leuchtturm (pronounced "loyk-tuhrm"). 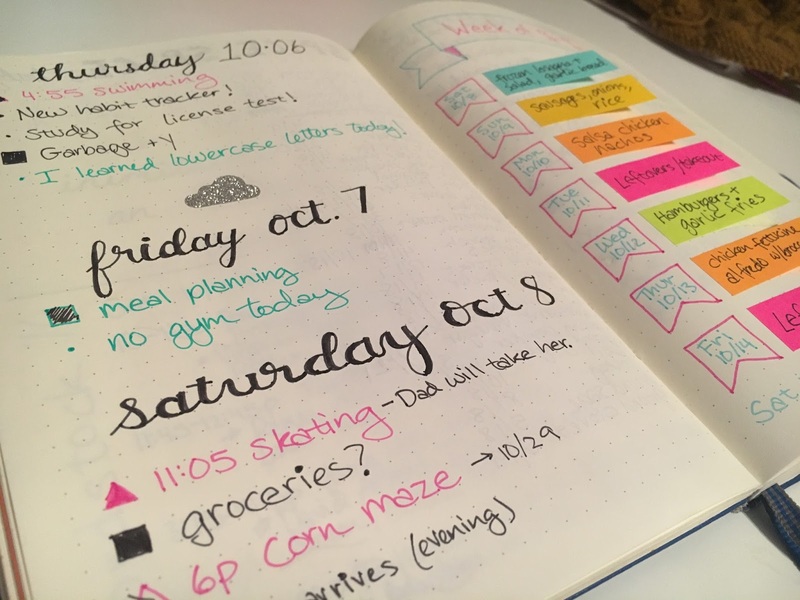 In bullet journalling, there is something called a Future Log, which is basically the section in your notebook where you write down events to come in the future. Normally you set this up in the front of your notebook, either for the whole year or for just a few months in advance. 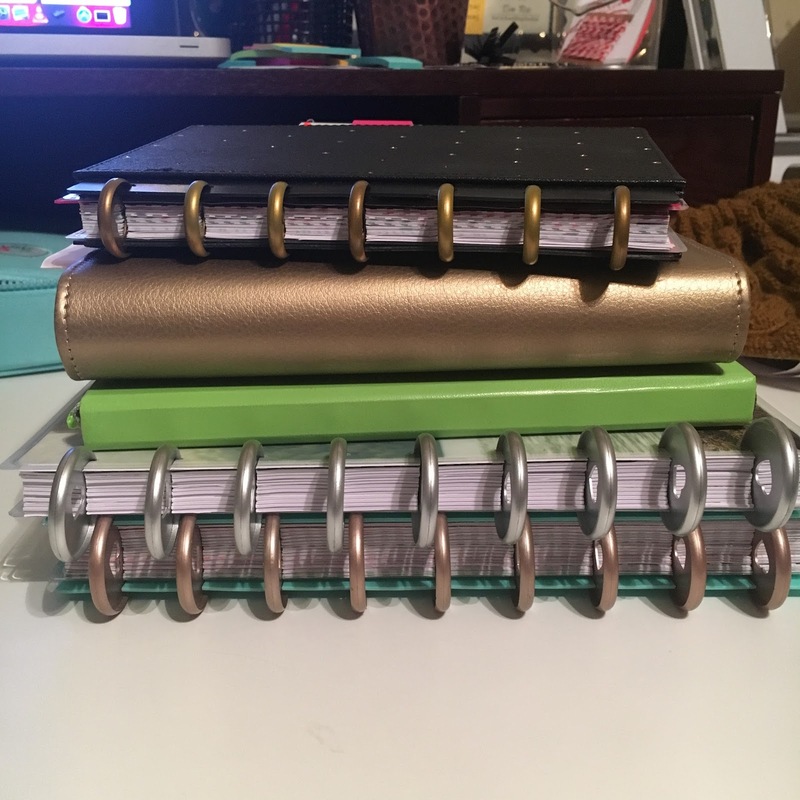 For me, personally, one notebook is not enough for an entire year (considering how I like to pack my bullet journal with lists, pages and pages of journalling, daily brush lettering practice, etc. ), and I didn't want to write down events for the distant future and then have to copy them all over again every time I needed to start a new notebook. So my solution was to buy a pre-dated planner, one that would last me the entire year. 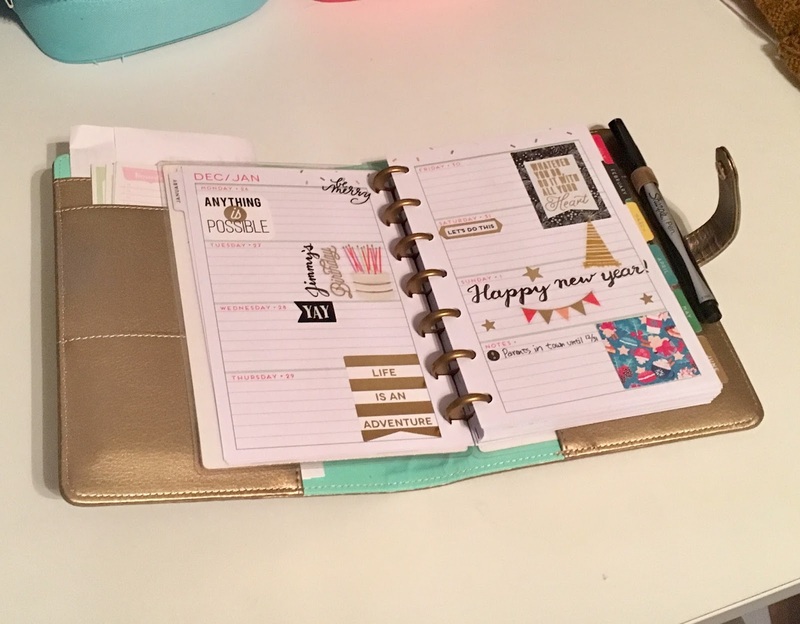 The Mini Happy Planner was the best solution for this for me, because even with the gold deluxe cover, it still fits nicely in my purse alongside my Leuchtturm, and I can add/remove pages as I need. 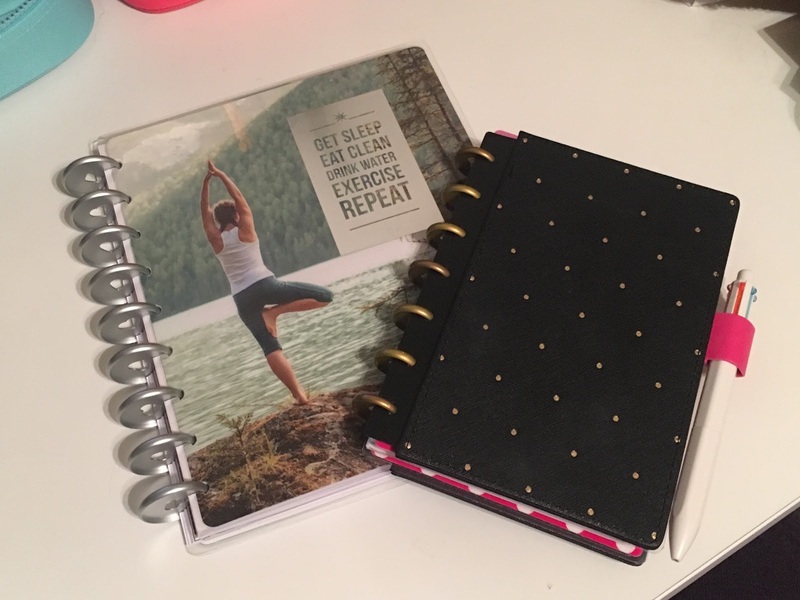 I plan to put special focus on my health and fitness this year (as I aim for some very big powerlifting goals), so I also have the Fitness Happy Planner that I'm using for meal planning and meal logging. I know it's a Fitness HP, but really, most of the space on each page is dedicated to logging meals. 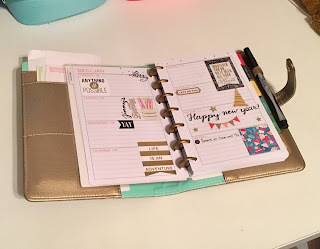 There is really no way I can log my workouts in the detail that I want, so I have another Mini Happy Planner where I can write down sets/reps/weights or my swim workouts. 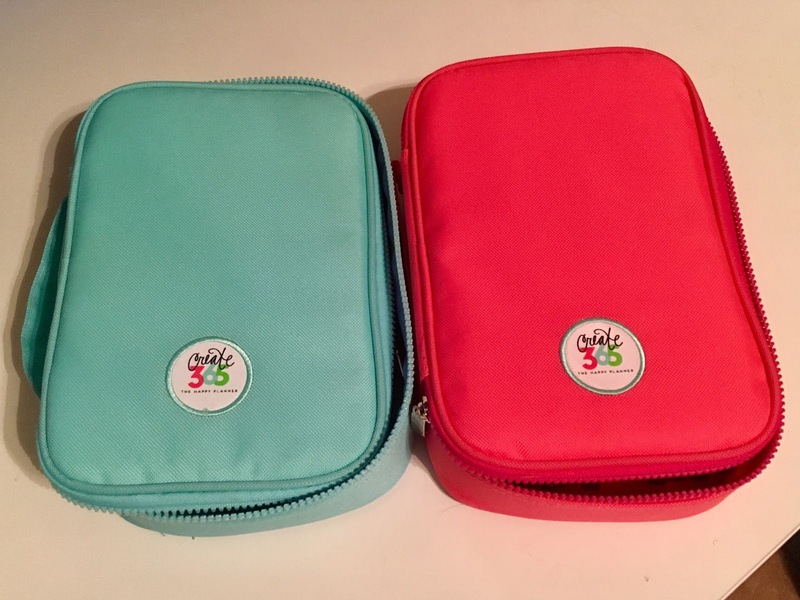 It's tiny, so it travels nicely in my gym bag, and I've put on the Mini snap-on covers so it doesn't get thrashed by my gear. Mainly, I use Sharpie pens (the non-permanent kind). I mostly write with black, but it's handy having the other colors. The tips are 0.3mm. You can also see next to the Sharpie pens are a few Sakura Pigma Micron pens. 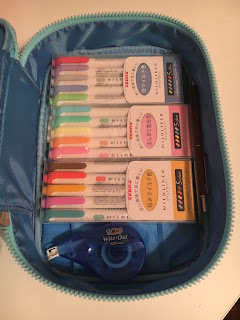 I actually bought them for drawing Zentangles, but they're useful for my planner as well, since I bought a set that has a size 01 (0.25mm), size 03 (0.35mm), and size 05 (0.45mm) and can therefore write/draw lines of different weights. 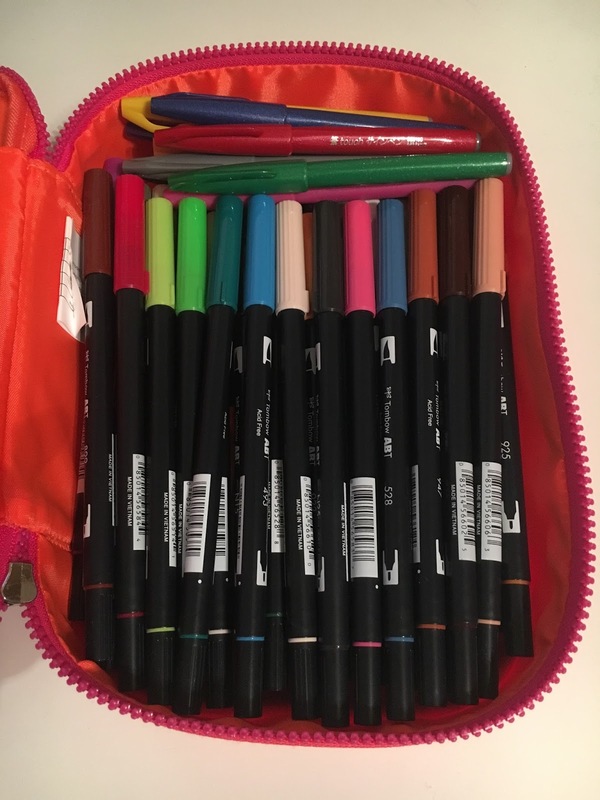 I've always loved highlighters, and these Zebra Mildliners are my favorites right now. They are double-tipped - chisel tip and fine tip - and come in an interesting variety of colors. The set in the middle (with the pink labeling) is your traditional neon set of highlighters, but the others are totally unusual for highlighters - one set even includes a GRAY highlighter, and that is probably the one I use most of all. It's a beautiful soft gray! 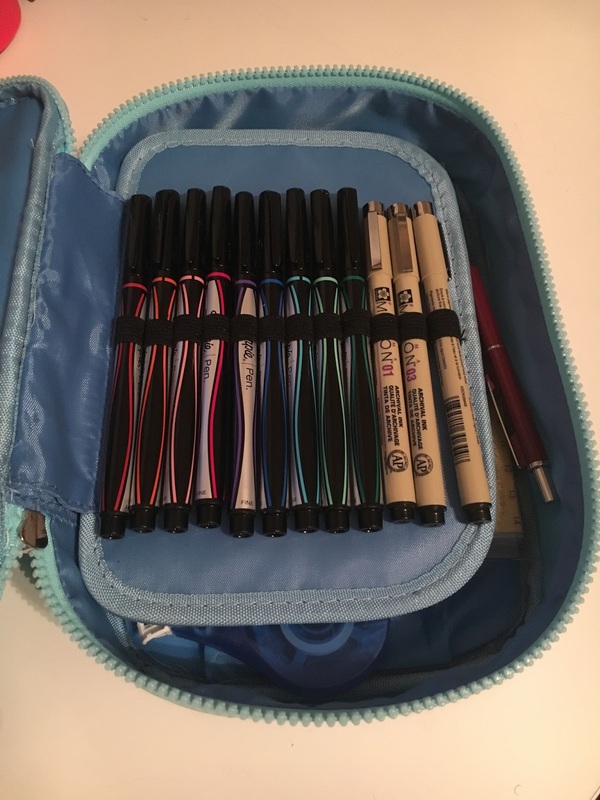 And of course, my kit also includes a mechanical pencil, a six-inch ruler (not visible because it's hiding), and some white-out tape, because I mess up quite often. I also keep handy a giant glue stick and an Exacto knife, but they don't live in my pen bag. I mentioned earlier that I've learned brush lettering, so that requires supplies as well. For large brush letters, I love Tombow's Dual Brush Pens, which are also double-tipped (brush and bullet) and come in a large variety of colors. (They're the big long ones you see in the photo.) For small brush letters, I really like Tombow's Fudenosuke Brush Pen (Soft) (not pictured), but it only comes in black, so I also have a set of Pentel's Brush Tip Sign Pens for when I want some color. (Those are at the top of the photo.) 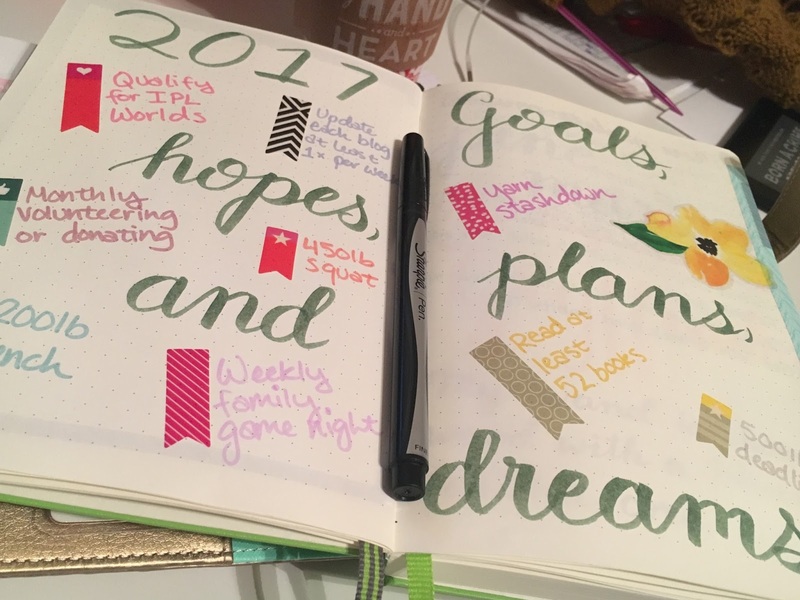 You can see an example of their relative sizes on paper if you scroll back up to the photo of my 2017 Leuchtturm with the January quote. And of course, keeping everything together and organized is easy with my Happy Planner pen cases. :) These can actually each fit a Mini Happy Planner or a Leuchtturm notebook, if I weren't trying to cram so many pens in them. 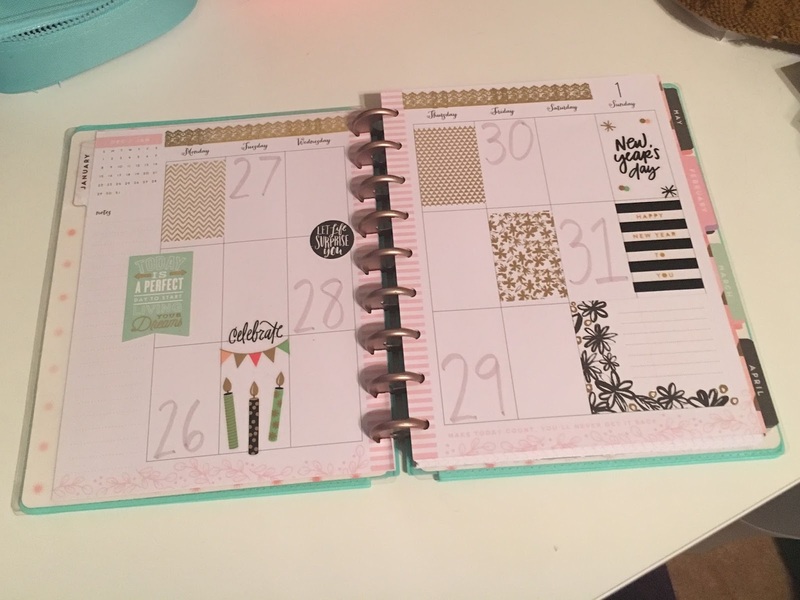 So now that my planners are all ready for the new year... what am I actually planning? As you might be able to tell from the very first picture in the post, I've got some big goals, especially in powerlifting. I would like to bring my numbers up to a 450 squat/200 bench/500 deadlift, as well as qualify for IPL Worlds (the international level of the US Powerlifting Association, or the USPA). As it stands, if I were to replicate my current maxes exactly without any improvement at an officially sanctioned meet, I would technically qualify. BUT... just like runners trying to qualify for the Boston Marathon, you have to put up the numbers at an event that they'll count. It was hard enough for me to do it the first time, so I'm not taking it for granted that I'll be able to do it again. I've been really satisfied with my progress so far at Savage, but I think I'm still a long ways away from where I was last March. I will need to really push myself to be consistent and work hard if I want to get back there again. - Have family game night every week, with either board games or video games. - And all the usual health-related stuff like sleep at least 7-8 hours a night, drink 64oz of water daily, and work out 3-5x per week. All in all, I'm excited for what this year could bring. I plan to hit 35 feeling better than I did at 25. Wish me luck :) I'm going to need it.